My cheap and flimsy acrylic gloves have NOT been serving me well this winter, and after getting horribly cold and soggy fingers while sledding with my daughter last week, I decided to take matters into my own hands. 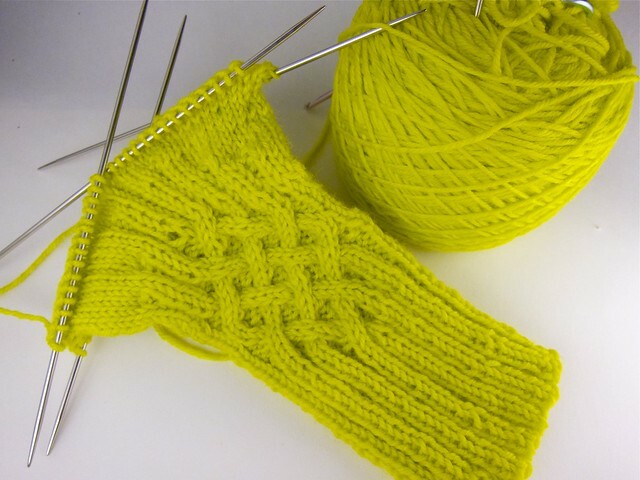 This beautifully cabled design is the free Knotty gloves pattern by Laris Designs. 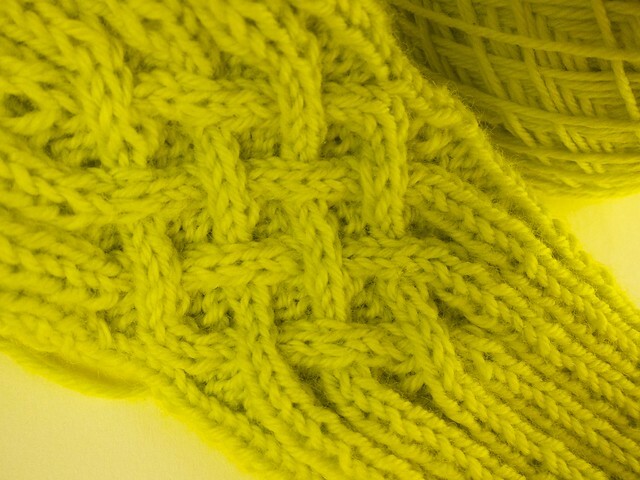 The eye-searing chartreuse yarn is Studio Avenue 6 Bellweather Sock in the "Spring" colorway. (See my Ravelry project details if you so choose). The cables are super pretty, but I will admint I had to rip back and reknit these about three times so far due to lopsided chart-reading mishaps whilst watching the last season of True Blood with my husband late at night. (Clearly, it is all the fault of those vampires, fairies and fairy vampires). My winter-glove-making timing may seem a bit off, but as I type this it is snowing outside my Brooklyn window. I'm sure I will finish them JUST as soon as they are not actually needed any more this season. Oh, your yarn is delightful! I love seeing pops of color among the grey during winter months! Good to see you back to blogging. I´ve knit those gloves while on summer vacation 3 years ago. I had to rip back the cable pattern a couple of times as well. I still wear and love them a lot. Did you know there is also a Knotty hat? No, I didn't! That's awesome, I will check it out.